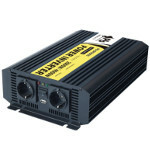 We distribute dc/ac inverters by Premium Energy of pure sine wave, in input voltages of 12Vdc or 24Vdc. These inverters are designed in Spain and the technical service is located in Barcelona. They have a SOFT START design and provide maximum reliability to transform the current from 12V / 24V / 48V to 230V..
With our converters you can solve your 230V power problems in: motorhomes, nautical, automobiles, ambulances, photovoltaic solar energy, campsites, microwave ovens, refrigerators or compressor freezers, electric coffee makers, vacuum cleaner, dryer, iron, bread toaster, blender , appliances up to 3000 W, fans, televisions, videos, computers, ... Endless applications. Suitable for all types of reactive / inductive loads. If you can not find the investor you are looking for, please contact us because we can find a solution to your needs. Next: Distributions » Enamelled Copper wire.